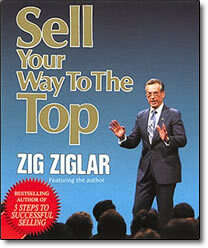 Sell Your Way To The TOP – CDs or MP3 by Zig Ziglar – Discount! Drawing on his own proven selling strategies that build successful sales careers, mega-bestselling author Zig Ziglar tells you how to turn every no into a yes and improve your prospecting, overcome price objections, and close more deals with finesse and style. The mere mention of his name opens doors — and hearts — in sales organizations throughout the world. He’s Zig Ziglar, and when it comes to selling, he’s done it all. And as a motivational speaker, he has sold sales people on the importance of their career and their contribution to society. Combining vivid scenarios and crystal clear instructions, Ziglar will motivate you to reach your peak as a sales star. You’ll learn how to add the personal touch to client relations making you more effective than ever at demonstrating the need for your product or service. With these important skills, you’ll become a word merchant who paints verbal pictures that capture your client’s full attention. More than a guide to closing a single sale, Sell Your Way To The Top will help you open the door to a profitable sales career — because no one can teach you how to make your sales percentages skyrocket like Zig Ziglar can. Zig Ziglar can put money in your pocket! Discover the 44 proven best ways to close a sale, the 5 basic reasons why prospects don’t buy, 24 negative words to avoid, and more. Sell Your Way To The Top is full of money-making, deal-closing techniques that can bring huge rewards!